The Manial Palace & Museum (commonly Mohamed Ali Palace) is one of our favourite places in Cairo. What we love the most about this place is the exhibitions they host in the the museum’s Grand Hall. In our most recent visit, we came across an exciting exhibition. We were greeted by the people behind the exhibition: Omar Abd El Rahman and Shorouk Magdy. They’re both students at the Art Education Faculty, and have created a gallery filled with captivating portraits. Omar and Shorouk explained that the exhibition is the idea of Dr. Mahmoud Said, who supervised a large group of young artists executing the idea, Omar and Shorouk were among them. Their exhibition is also supervised by the Ministry of Antiquities and the Manial Palace & Museum, in co-operation with the Art Education Faculty. 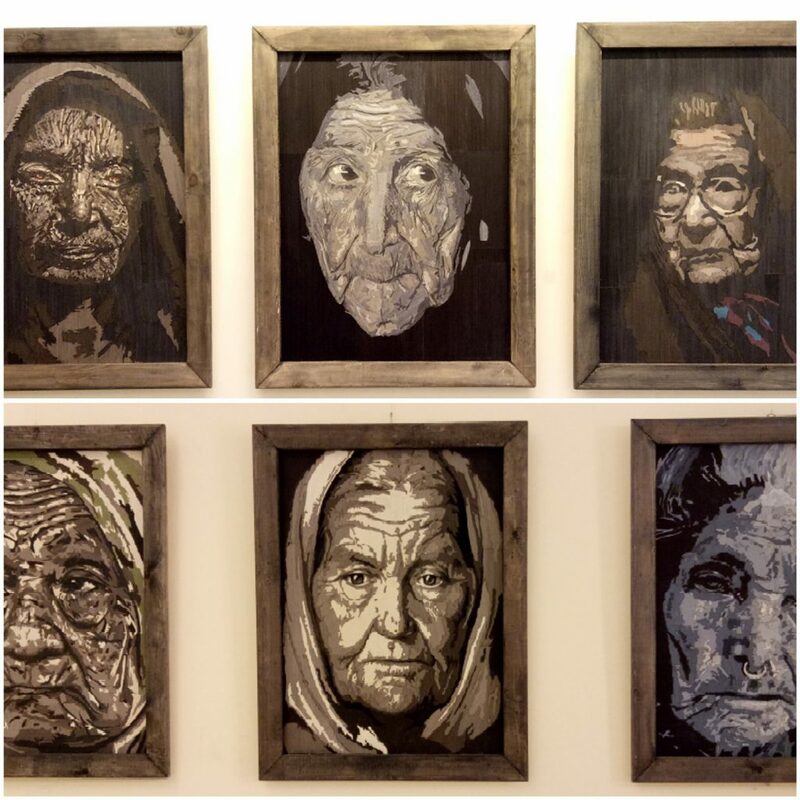 The exhibition’s name is quite unusual, Taga’id (literally translating to wrinkles), but when you look at the pieces of art, the name is not so unusual anymore. The portraits are all focused on showcasing the beauty of wrinkles on the faces of older people. Most people hate seeing wrinkles on their face, but the young artists have tried to represent those wrinkles in an artistically unique manner. Once you spend a little time observing the art pieces, you’ll notice that they have a unique texture and look, unlike most portraits you’ve seen before. This is why we decided to ask them about the materials they used, to which they replied: “wood veneer and natural colours.” They explained that they saw it as the perfect way to highlight the details on each of the faces. Omar and Shorouk want to send a message to their fellow colleagues that being a student of the Art Education Faculty doesn’t necessarily mean you have to end up working as an Art Teacher; indeed, you can become as big an artist as you dream. They want to encourage their colleagues to use their respective talents in chasing their ambitions. As for their bigger goal, Omar and Shorouk wish to see their exhibitions travel to different locations around Egypt, the Middle East, and all countries around the world. Our visit to this museum was highly enjoyable, and we’re glad that chance brought us here. You can visit this exhibition daily from 9 am to 4 pm; the exhibition is running till the 31st of March.